I love sandwiches. My love for the right combination of textures and flavors between two slices of amazing bread is ridiculous. During the summer, my life is a tomato sandwich. In the spring I love radishes, cold stored apples and some greens. But sometimes, you just can't find good produce, or you are craving something warmer, heartier and different. This early spring sandwich uses roasted beets as the meaty part of the sandwich and dare I say it...a bit of bacon (locally raised from the farmers market, so calm down). 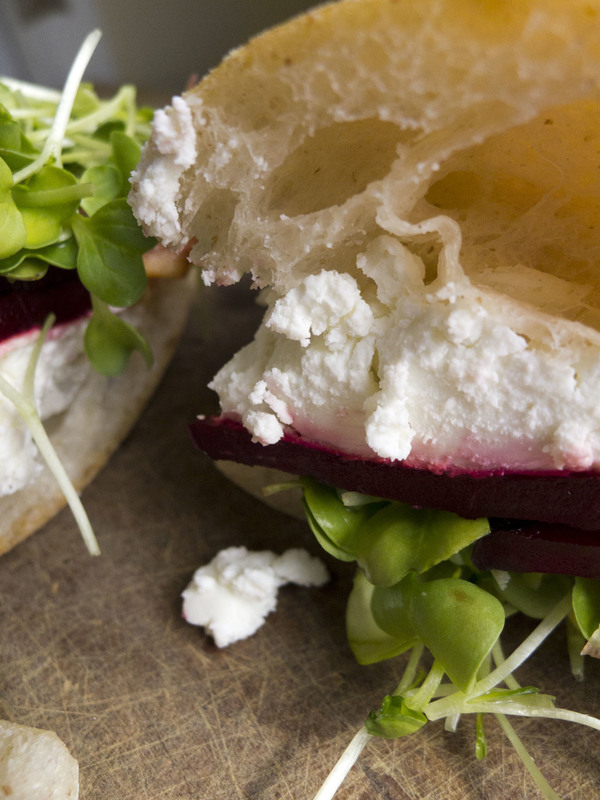 Instead of a mayo or mustard, I spread goat cheese for a creamy texture and for a little crunch and green, the sandwich is filled with some micro greens. And of course, the bread...this mini ciabatta loaf from the farmers market is a treat. My preference, of course, is for a whole wheat bread, but fresh ciabatta? Wonderful and worth it. /// Directions /// Peel and slice beets into rounds. Place on a baking sheet and roast at 350 F until you can pierce with a fork with a bit of resistance (we don't want mushy!). If using bacon, cook and drain. Slice ciabatta in half and toast. Spread goat cheese on bread. Layer with beet rounds, bacon and micro greens.